Ready to get your craft on? Be sure to check out Craftsy.com to sharpen your skills no matter what your craft-du-jour may be. 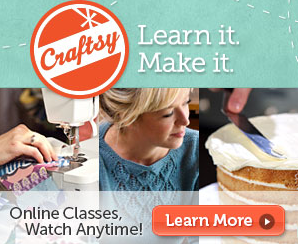 Craftsy offers courses on everything from knitting to cake decorating. And the best part? There is a huge selection of mini courses that are ENTIRELY FREE. Okay, that's not really the best part. The best part is that you follow the courses online at home. And do you know what that means? You can learn a new skill without putting on a bra. And isn't that what all of us are really after? Full disclosure: If you click on the above links and sign-up a small amount of money will come to me. This is a great way for you to support this site and I really appreciate it!